Provenance: Excollection Graham Gallery, New York. 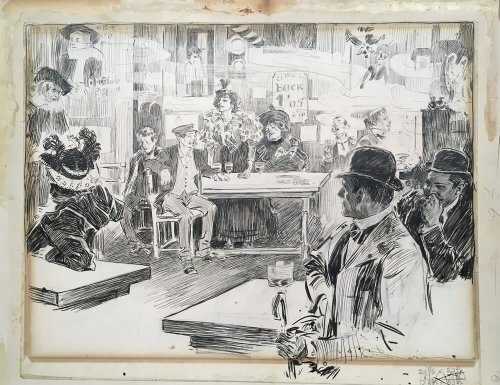 Comment: I think that it's fair to say that the standard for American pen and ink illustrators of the late 19th and early 20th century is without a doubt Charles Dana Gibson. He was a celebrity back in the days when an illustrator could be one. His deft lines and observational skills made him the Toast of the Town… in a sense, WHICH town didn't matter. Here he is recording the goings-on in Paris just prior to the turn of the century. Condition	 Art has been mounted to another sheet, likely in about the 1960s. Have the Graham Gallery mat and backing, but not the old frame. Publication Information	 Originally for LIFE magazine. Reproduced in the Gibson compilation book Pictures of People which was published in 1900 and subsequently in the compilation of compilations The Gibson Book volume I in which it is entitled “Aristide Bruant's”.